High temperature, fast neutron reactors are the obvious future source of both electricity and liquid fuels. There are many versions of small nuclear reactors operating around the world – starting with the US military in the 1950’s. There are eight new small modular reactors on a fast track to generic approval in the US – and more than 45 concepts and designs under development globally. A version of the high temperature, fast neutron technology was first built in Germany in the early 1960’s, a prototype was run at the Los Alamos National Laboratory in the late 1960’s, a demonstration plant is being constructed in China after a decade of running a prototype there. 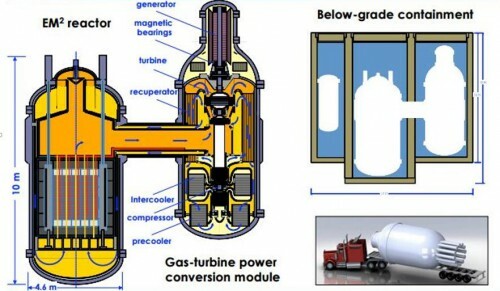 In February 2010, General Atomics (GA) announced a modified version of its GT–MHR design as a fast neutron reactor – the Energy Multiplier Module (EM2). The EM2 is a 240 MWe helium cooled fast neutron high temperature reactor operating at 850°C. The company anticipates a 12 year development and licensing period. GA has teamed up with Chicago Bridge & Iron, Mitsubishi Heavy Industries, and the Idaho National Laboratory to develop the EM2. The EM2 is a technology evolution designed to a performance specification that included cost, safety, fabrication, installation and operations that give it outstanding potential to change the energy landscape. The fast-neutron reaction first converts fertile material – including uranium, plutonium and thorium – to fissile material which then splits under neutron bombardment to produce heat and lighter elements. Inert helium moving through and around the core is heated and drives a high efficiency Brayton cycle turbine. Helium is then cycled back through the reactor. Helium – rather than water – cooling enables siting flexibility in a footprint that is ten times less than conventional nuclear plants. The small modular design allows network grids to be developed in place of large and expensive grids shuffling energy across whole continents. A huge cost advantage in regions without existing electricity grids. High temperature operation enables efficient conversion of heat to electricity. It enables hydrogen production with what would otherwise be waste power and heat in low load periods. Liquid fuels compatible with existing infrastructure can be produced from hydrogen and captured carbon dioxide. High efficiency – 50% greater than conventional nuclear – cuts costs of power by 40%. Sufficient to make it cost competitive against natural gas generation in the USA at a gas price of $6-$7/MMBtu. Natural gas prices are about half that at the moment – suggesting that a natural gas to advanced nuclear strategy is the optimal energy future. It is a relatively small heat source and combined turbine that can be factory built, delivered on trucks and dropped into place – anywhere as they don’t need water cooling – for decades of hands free operation powering 350,000 houses per unit. The promise of EM2 is to deliver low cost power for centuries to come from spent nuclear fuel currently stockpiled – burning 100 times more of the energy content of fuel than conventional reactors. Globally there are hundreds of thousands of tons of conventional nuclear waste sitting in stockpiles. The EM2 can burn conventional waste, uranium or thorium providing essentially limitless energy. Let’s start at the back end – nuclear waste. High-level wastes are produced in the fission process from enriched uranium. The ‘spent fuel’ is easily radioactive enough to kill with a short contact exposure many years after removal from reactors. Isotopes from long lived waste can enter the environment and the food chain where the dose is far less but the exposure is longer and more widely spread. In nuclear fission uranium atoms split converting mass to heat. The fission process creates radioactive isotopes of lighter elements such as cesium-137 and strontium-90. These are “fission products” and account for most of the heat and radioactivity in high-level waste. Some uranium atoms capture neutrons and form heavier elements – actinides – such as plutonium. Radioactive isotopes decay to harmless materials. Some decay in hours, but others over many thousands of years. Strontium-90 and cesium-137 have half-lives of 30 years – half the radioactivity will decay in 30 years. Plutonium-239 has a half-life of 24,000 years. Conventional nuclear waste contains 96.6% uranium oxide, 3.4% fission products and 1% long lived actinides. The EM2 design provides for recycling waste from conventional plants by passing it through a number of burn cycles in EM2 reactors. Fission products – a small proportion of the waste – can be removed using a plasma mass filter after each burn cycle. Waste fission products cannot be used in nuclear weapons and can be held safely in a repository where the radioactivity decays to levels in the original ore over 300 years. The remainder of the material – with added fertile material from stored conventional nuclear waste – is returned as fuel in the next burn cycle. The reactor core design provides for factory sealing and a 30 year burn cycle without refuelling. The reactor is designed to never be opened on site and thus there is little opportunity for diversion of fissile material from operating plants. The core design uses uranium carbide particles that are sintered into porous fuel plates and isolated from the main helium coolant flow with a silicon carbide coating. The silicon carbide is stable up to 20000C and won’t meltdown under any conditions. In normal operation heat is diverted to the turbine or passively circulated through 100% redundant heat sinks. The porous fuel plates provides for gases generated during fission to be vented and scrubbed through filters. The backup to the backups is full containment in an underground reinforced concrete bunker. Nuclear reactors have significant excess generating capacity. High temperature reactors can provide heat and power during low load periods – or as dedicated hydrogen production facilities – for efficient hydrogen production by high temperature electrolysis. Air capture of carbon dioxide (CO2) enables centralised facilities to scrub carbon dioxide from the atmosphere. Air capture can provide pure CO2 for industrial use. Captured CO2 can be catalysed with hydrogen to manufacture ultra-low emission liquid fuels. Carbon Engineering (CE) is developing a scalable industrial technology to scrub CO2 from the air. Construction is underway at their Squamish demonstration plant site. The “wet end” of the plant circulates liquid to scrub CO2 from the air and then concentrates the product in solid calcium carbonate pellets. 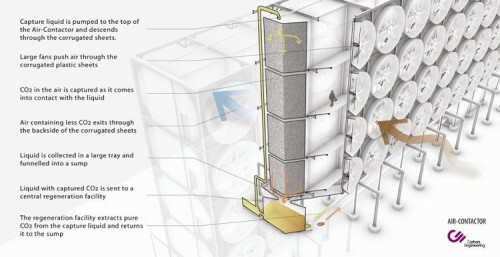 The “hot end” of the plant processes the solid pellets to produce pure CO2 while re-making the original capture chemical to begin the cycle again. Electricity from nuclear power plants could eliminate 26% of global greenhouse gas emissions. Liquid fuels produced from hydrogen and captured CO2 another 13%. Technological convergence provides an alternative to sources of energy that seem likely to become increasingly scarce and expensive. Going beyond that requires a whole new approach – although cheap and reliable energy is the foundation for social progress and economic development. Economic growth provides resources for solving problems – restoring organic carbon in agricultural soils, conserving and restoring ecosystems, better sanitation and safer water, better health and education, updating the diesel fleet and other productive assets to emit less black carbon, replacing cooking fires with better ways of preparing food, etc. We can sequester carbon in agricultural soils and increase productivity, conserve and restore ecosystems, reduce nitrous oxide and harmful tropospheric ozone emissions and save money on fertilisers, reduce the strong climate effects of black carbon and the millions of premature deaths that result from cooking over open fires at the same time. Population, development, technical innovation, multiple gases and aerosols across sectors, land use change, and the environment is the broader context. This entry was posted in Focus Area 7 and tagged energy, greenhouse gas emissions, industrialization, power generation, sustainable development, technology. Bookmark the permalink.